Short-Term Medicare Rehabilitation provides skilled care following an illness or injury. 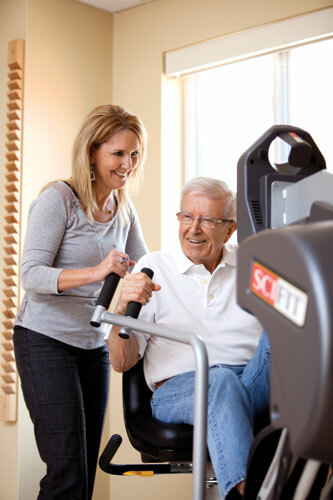 At The Sarah Community, we focus on the health of the entire person, helping our residents achieve their most fulfilling and independent lifestyle through social, emotional and physical efforts. This care can include physical, occupational and speech therapies to improve wellness and independence. Our experienced rehabilitation team of physicians, licensed nurses, therapists, dietitians, recreation specialists, and spiritual advisors all work together to create individualized treatment programs that help get you back to where you were. We also follow the philosophy of "Person-Centered Care." This means our residents have a greater say in their day-to-day lives, they are encouraged to make their own decisions, and they are offered more choices in how they want to live through giving them meaningful activities and opportunities to experience self-worth and purpose in daily life. Person-Centered Care also means that our staff has a closer relationship to residents, and staff members have the authority to quickly respond to individual resident needs. This creates a closer relationship between staff and residents, which ultimately leads to better care and faster healing.